Hundreds of protesters marched in Melbourne on Saturday to protest against on-the-spot fines for offensive language in public. 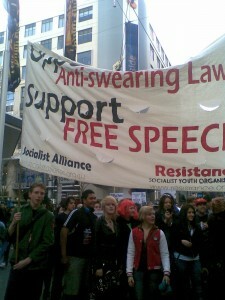 About 500 mainly young protesters chanted slogans demanding free speech not fines in the CBD. Yelling offensive words they marched from Flinders Street station and down Bourke St demanding the government scrap the legislation to fine people. Jesse Briggs, 19, said he attended the rally because he hates the idea of people paying for swearing: “I hate people paying for swearing. I think the solution is to swear more,” he said. Nick Gioskos, 20, said he attended the protest because he believes it goes against a free society. “I would think that goes against what a free society is supposed to stand for,” he said. Reubin Williams, 23 said he organised the event through Facebook to show his disagreement with on-the-spot fines for language introduced by the Victorian government. “I think it is unjustifiable. It affects a lot of people personally and I disagree with it so I stood up,“ he said. Mr Williams believes that swearing is no longer offensive while other slogans are. “Stop the boats – I think that’s offensive language,” he said. “Swearing I don’t consider to be offensive. It’s just casual, maybe colourful language. Mr Williams said the event was originally intended as a joke. “It started as a bit of a joke. I saw some articles about the swearing law and thought that’s fucked so jokingly started the Facebook page “Fuckwalk”. Within 24 hours there was 1000 people attending, that’s when I thought it’s time to get serious and people are taking this seriously,“ he said. Resistance activist Mikaela, who led the chant in the rally, says it is a stupid law giving police extraordinary power. “The government hasn’t actually come out with a statement entitling what offensive language and behaviour is. So this will give police extraordinary power over regular people, it will be used against protesters, homeless and Aboriginal people. It is just a stupid, petty law, they are completely ignoring the real issues,” she said. Constantly chanting swear words for most of the hour, the protesters were only quietened down when speakers addressed the crowds. Socialist Alliance state convenor Sue Bolton said this proposed law was totally arbitrary. “It will be totally arbitrary. The police will be able to pick and choose who they use this law against, where they use it and they will be able to decide on the spot whether they consider the word a swear word or not,” she said. “I think that it is very dangerous for the police to have that level of power. The solution would be having no law governing language. Police said they were happy with the behaviour of the crowd protesting. No arrests were made.